OK Bama fans... the A-Day game has been announced. 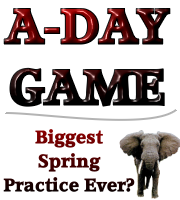 It is going to be A-Day Game will be at 2 p.m. on April 17 at Bryant-Denny Stadium. Practice is set to start on March 12 just before spring break. Hopefully, Alabama fans will turn out in droves like the biggest A-Day ever when attendance exceeded 92K+ fans with others waiting outside. The place was electric that day for a spring that began the process which lead to this year's first championship of this century. Are you going to come to the game pumped up? Comment on Facebook! We plan on being there, can’t wait to see the 2010 team and new stadium expansion! I would like to get tickets for some of next years games but that probably won’t be possible.